Please only Text 641-494-9494 the (563)# is the office phone and fwds calls so you only have to call one # and get me 24/7. No one puts "insurance claim" on their holiday wish list. Most would rate this item right below a lump of coal. Yet, due to a lack of safety measures, this is what many people get. Keep your cords nice, not naughty: Exercise caution when working with electricity. Don't overload your outlets. Use extension cords sparingly. Check flickering lights. Immediately replace those with loose connections or corroded sockets. Be cautious with candles: Candles add ambiance and appeal to your space, but they can also cause devastation. Keep them away from flammable materials. Never leave them burning unattended. If you don't want to worry about extinguishing candles before leaving or going to bed, consider using some flameless ones this year. Don't fall for outdoor lighting: Yes, your roofline may look great with perfectly strung lights, but don't risk your life to get them up there. Use proper safety measures and products designed for outdoor use. Who says hosting means cooking? Order in instead. Offer a selection of gourmet pizzas, sushi, or Chinese takeout. It's fun, delicious - and easy. Don't fuss with cutlery; supply chopsticks and lots of table napkins. Set out a variety of beverages, add a simple dessert, and you have a dinner party! Potlucks can be boring, but not when you add the element of competition. Host a contest. Call it "TV Chef: Holiday Edition," and ask each guest to contribute a dish. Assign categories, such as appetizers, salads, mains, sides, and desserts. (Hint 1: ask what they're bringing ahead of time to avoid duplication.) You'll need volunteers to judge. (Hint 2: kids might enjoy being on the judging panel.) The winning dish gets a fun prize. You relax. Everyone enjoys. It's a win-win! In 1979, two Scrabble lovers, Chris Haney and Scott Abbott, decided to create their own game - Trivial Pursuit. And the rest is game history: Trivial Pursuit sold more than 100 million copies worldwide and earned more than a billion dollars. Because, as Haney and Abbott knew, everyone is fascinated with factoids. Why people find these tiny bits of useless information so endlessly fascinating is anyone's guess. Some experts believe the attraction comes from a competitive need to demonstrate superior intelligence. Some attribute it to a curious mind. Others believe it's considered a method of brain training. And still others believe it's just great entertainment. In fact, trivia games are also good for us. 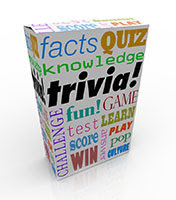 Great bonding activities, trivia competitions also make people happy and reduce stress hormones. Notes Allquizquestions.com: "It enhances our focus, learning and thinking abilities." Whatever the reason, as The Point Magazine points out: "Quizzing, sometimes referred to as 'trivia,' has been a part of popular culture for many decades." In the 1940s and '50s, for example, families gathered around their radio to hear The Quiz Kids - five super-bright youngsters who answered audience - submitted questions. With the arrival of TV, "The $64,000 Question" and other trivia-based contests filled much-needed programming space. The public loved them. You're planning a holiday bash. You have a checklist that covers every detail from decorations to desserts. It's something many party hosts overlook. When you're putting on an event, it's important to consider your own liability and ensure the proper policies are in place. Your homeowners' policy may have limitations that mean it could be inadequate for what you're planning. Depending on the size of your event, you may want to consider taking out an umbrella policy or special event insurance. Your home insurance policy typically includes liability coverage. If someone is injured at your party, this coverage will kick in to pay for the associated expenses. However, if several people are injured, it may not provide sufficient coverage. Your options are to increase the limits on your home insurance policy or add an umbrella policy to expand the coverage. Often, it's more cost-effective to add the umbrella than to increase your limits. Consult with your insurance agent to determine your best option. As you review your options with your insurance professional, consider the location of the event, the number of attendees, the activities taking place at the party, and your current coverage. These details will help you determine if your current homeowners' policy is sufficient or if you need to make changes. And with this item checked off your list, you'll be better prepared to sit back and enjoy the party yourself. How many questions were in the original Trivial Pursuit game? Preheat oven to 350 degrees and line 2 baking trays with parchment paper. Place one sheet of puff pastry on each tray. Cut each sheet into 9 equal squares (3x3 inches). Place a rounded teaspoon of tomato in the center of each square, spreading it out to opposite corners. Sprinkle a tablespoon of cheese along the same area and place a basil leaf on top. Fold opposite corners together. Press firmly to hold in place. Brush with egg wash and season with salt and pepper. Bake for 15-20 minutes or until golden brown. Allow to cool slightly then drizzle with balsamic glaze. Serve warm.